Hardback. New. 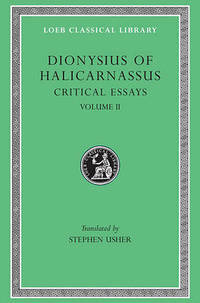 Dionysius of Halicarnassus, born c. 60 BCE, aimed in his critical essays to reassert the primacy of Greek as the literary language of the Mediterranean world. They constitute an important development from the somewhat mechanical techniques of rhetorical handbooks to more sensitive criticism of individual authors.